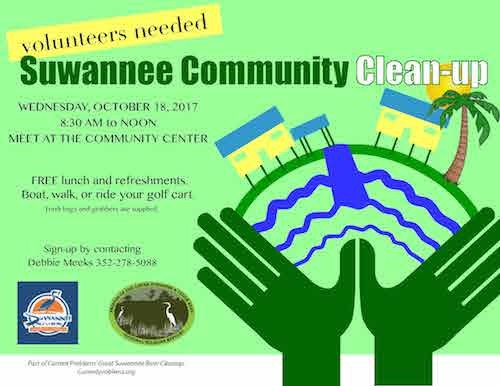 Meet at the Suwannee Community Center on Wednesday, October 18 at 8:30 a.m. for the annual community cleanup. Boat, walk or ride your golf cart to help de-litter the roads and waterways around Suwannee. Refuge staff will transport volunteers down the river from Fowlers Bluff, there is room for 16 onboard. Free smoked chicken lunch at noon provided by Jerry Everett of the Waterfront Market. Contact Debbie Meeks at 352-278-5088. You don’t have to come to the community center at 8:30 if you coordinate with me ahead of time, don’t miss lunch!